Share files with anyone inside or outside your company. 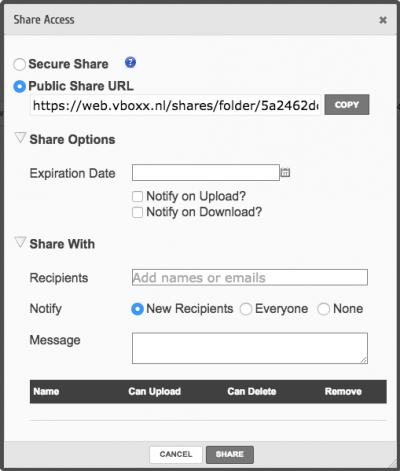 Take advantage of password protected shares, and set up upload and download notifications when sharing files. Securely share content with your team, with the help of team shares. Control who has access to folders and which devices can access team shares. Seamlessly share content with your team using the vBoxx Sync Tool and edit Microsoft Office documents online with the online editor. Install the vBoxx Sync Tool on your laptop, smartphone or tablet and access your files anywhere you go. 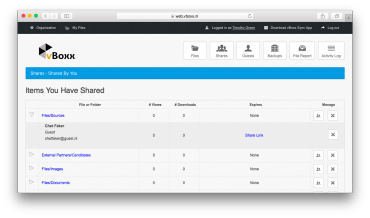 Securely share content with anyone, if the receiver is not registered in vBoxxCloud, a free guest user account is automatically created to access content. Create a public link to quickly share files and folders. Either send a direct e-mail or copy the link and share it as you would like. Set up download and upload notifications. Restrict the availability of your content by setting an expiration date or the maximum number of downloads. Create guest accounts at no additional cost to securely share content outside your company. Guest users access content through the web interface, and admins can easily manage and track guest account activity. Any shares can be monitored, if you want to stop sharing, you can remove users or delete the share completely. You can track folder activity with the Activity Log.